If you're like many environmentally-conscious people, you want to avoid the use of plastic and paper grocery bags when you do your shopping. You can purchase a reusable bag to take to the store, but for a most cost-effective and personal option, it's fun to make your own. This free pattern can help. 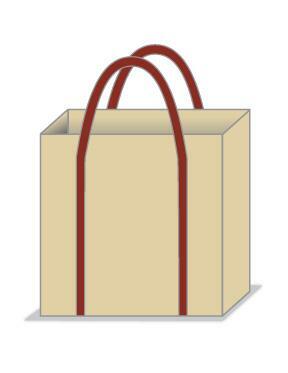 Print this free fabric grocery bag pattern! Making your own reusable grocery bags is easy, even if you don't have a lot of previous sewing experience. This pattern will help you make a lined grocery bag that is very strong and will last for years to come. Expect to spend about an hour making the bag. If you need help downloading the printable pattern, check out these helpful tips. Enlarge the pattern and print it out. To do so, download Adobe Reader. Click on the pattern and when the pop-up box opens, select "Open with Adobe Reader." From there, you can download, save, and print the pattern. Fold the fabric so that you have a double layer. 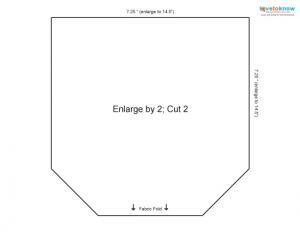 Place the pattern on the fold as directed and cut out two pieces. Crease the bottom folds with your iron. Retaining the folded bottom, pin one of the pieces up each side. Ensure that the right sides are together. Sew up the sides where you pinned, using a half-inch seam allowance. Align one side seam with the crease at the bottom. Pin the angled corner against itself. Sew the corner with a half-inch seam allowance and repeat with the other side. This gives your bag a flat bottom. Repeat with the other piece of fabric to create a second identical bag. This will be the lining. Place one bag inside the other, right sides together. Sew almost all the way around the top of the bag, using a half-inch seam allowance. Leave about three inches open for turning. Turn the bag right side out and press with the iron. Close up the turning opening with pins and topstitch the entire top of the bag about a quarter inch from the edge. Form the cotton webbing into a loop, sewing the raw ends together. Pin the loop to the fabric bag to create a double handle. Start at the bottom of the bag and work up both sides, ensuring the webbing is parallel to itself. Topstitch the webbing in place. Choose a fabric that's easy to wash, such as cotton. Grocery items may spill on your bag, and it's good to be able to toss it in the washing machine. Consider repurposing used clothes to make your bags. You can purchase old shirts and other items at the thrift store and cut them up to use for fabric. Be sure the cotton webbing goes all the way under the bag in a continuous loop. This will make sure the handles of the bag are the strongest part and that they can support heavy loads of groceries. After you've used the pattern to make your first bag, you'll find the process is easy to repeat. You can make yourself a whole set of bags or create these reusable grocery sacks as presents for friends and family. You can entirely skip over the paper vs. plastic question the next time you're at the grocery store when you pull out your own handmade cloth grocery bag. You'll be proud of your handiwork, as well as your commitment to protecting the environment.